Fans of Harry Potter can receive their long awaited Hogwarts acceptance letter with this Harry Potter Letter Zip Around Wallet! Inspired by Harry's magical acceptance letter, this wallet is designed with 12 card slots, 2 bill compartments, and an inner pocket. 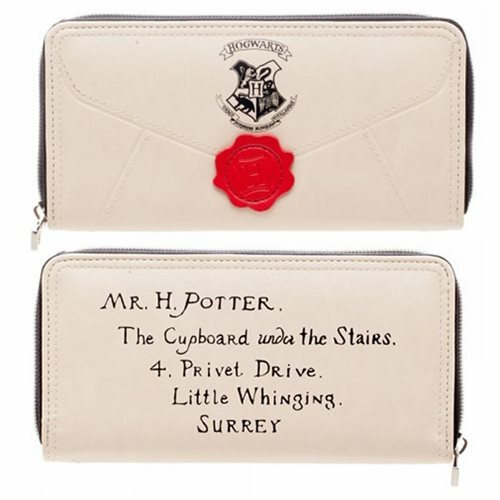 Complete with fun, unique details like Harry's address and the Hogwarts wax seal, this Harry Potter Letter Zip Around Wallet will be the perfect gift for any Harry Potter fan! Measures about 7 1/2-inches long x 5-inches tall. Ages 13 and up.